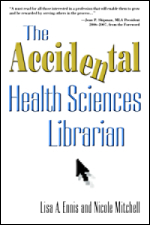 The Accidental Health Sciences Librarian | Books from Information Today, Inc. Sparked by an aging baby boomer population, the dizzying pace of breakthroughs in medical research, and an unprecedented proliferation of health information, you may soon discover a career opportunity in health sciences librarianship—if you aren’t already a part of this exciting field. In The Accidental Health Sciences Librarian, Lisa A. Ennis and Nicole Mitchell offer a thorough and up-to-date overview along with guidance on a range of critical resources, tools, and functions. Their coverage of such essential topics as HIPAA and MeSH, along with a wealth of expert tips and advice, is a must for all new, prospective, and working health sciences librarians.